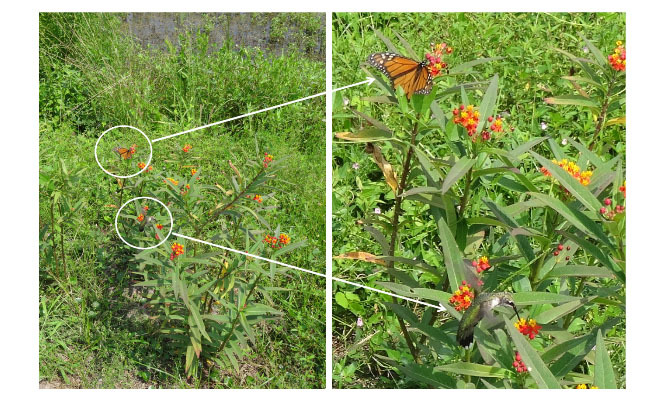 A Monarch Butterfly conservation project was implemented at Landfall Lake, with a generous donation from a Lake neighbor. The project involved planting more than 6,000 wildflowers, including 1,500 Scarlet Milkweed, Asclepius curassavica, seen below with a monarch butterfly and Ruby-throated Hummingbird feasting on flower nectar. We had tremendous support from Landfall residents and it was not only an educational event but a fun one too.